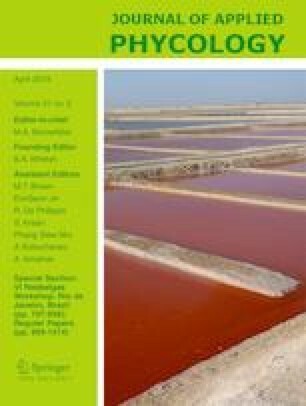 The combined effects of irradiance and temperature on photosystem II (PSII) photochemical efficiency were investigated in the microscopic sporophyte and macroscopic gametophyte stages of the cultivated red algae Pyropia yezoensis f. narawaensis and Pyropia tenera (Bangiales) from Kyushu Island, Japan. Continuous 12-h exposures to 10, 100, and 1000 μmol photons m−2 s−1 at 8, 20, and 28 °C revealed that sporophyte and gametophyte stages of both species have different tolerance characteristics to irradiance and temperature. Effective quantum yields (ΦPSII) of sporophytes declined at 100 and 1000 μmol photons m−2 s−1, and their maximum quantum yields (Fv/Fm) did not fully recover even after 12 h of dark acclimation, indicating photodamage. Furthermore, this depression was greatest at 8 °C, suggesting low temperature-enhanced photoinhibition. Larger declines of ΦPSII and subsequent failure of Fv/Fm recovery in the gametophyte were observed only at 1000 μmol photons m−2 s−1, suggesting that the macroscopic stage is more tolerant to relatively higher irradiance than the sporophyte. Farming protocols, including the timing of conchospore seeding, as well as depth range and duration for Nori-net cultivation need to be optimized to ensure sustainable production of these high-valued seaweed cultivars. We thank Mr. Misaji Kimura, a Pyropia seaweed farmer in Izumi, Kagoshima, for his kind arrangement of the sample collection of P. tenera gametophyte from his mariculture field. All authors have provided consent. This research was supported in part by the Grant-in-Aid for Scientific Research (#16H02939) from the Japanese Ministry of Education, Culture, Sport and Technology and the Japan Society for the Promotion of Science (JSPS).